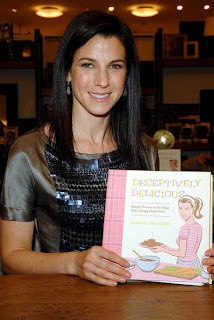 Last week, a federal appeals court upheld the previous decision of a lower court in the Jessica Seinfeld cookbook case. Jessica (Jerry Seinfeld’s wife) was sued for both trademark and copyright infringement by Missy Chase Lapine, author of “The Sneaky Chef: Simple Strategies for Hiding Healthy Foods in Kids’ Favorite Meals.” Jessica’s book is titled “Deceptively Delicious: Simple Secrets to Get Your Kids Eating Good Food.” See the original lower district's complaint here. It does seem a bit close for comfort, but two judges have now ruled that Jessica’s book is not a copycat. According to Judges Reena Raggi and Peter W. Hall of the Second U.S. Circuit Court of Appeals in Manhattan, “stockpiling vegetable purees for covert use in children’s food is an idea that cannot be copyrighted.” Conceptual ideas like that cannot be protected by copyright law. Seinfeld's intellectual property attorney's stated "countless prior works utilized this very same unprotectable idea," including a 1971 book." Lapine’s book was published four months previous to Seinfeld’s, and apparently, some publishers were looking at the books around the same time. It seems pretty unlikely that Jessica Seinfeld would have had enough time to plagiarize, since both books were published around the same time. On a side note – a slander case is still pending for Jerry Seinfeld’s jokes (when he said his wife is accused of "vegetable plagiarism") about the suit and Missy Lapine on The Tonight Show.